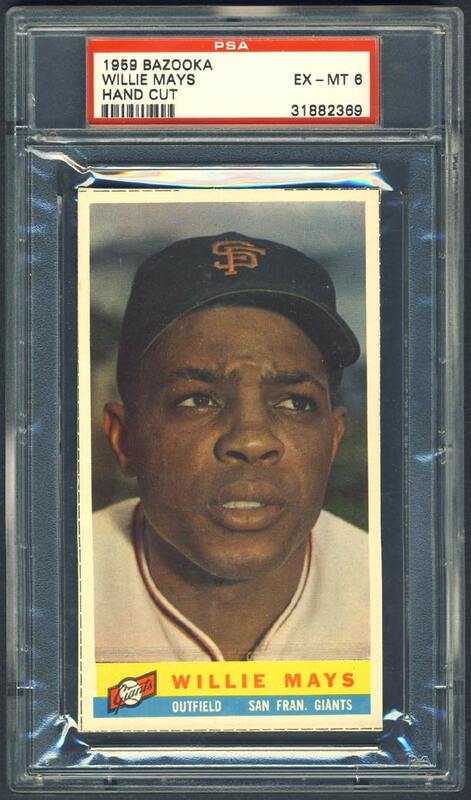 Willie Mays could do everything: hit, field, and run. While the Giant center fielder's 660 home runs ranks in the top-5 all-time, his magnificent over-the-shoulder catch of Vic Wertz's blast to center field in the 1954 World Series has become the standard against which all other catches are compared. 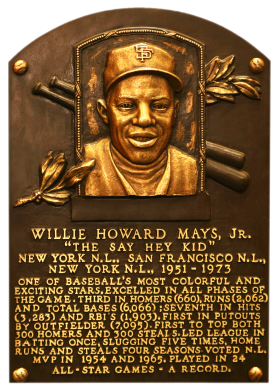 "The Say Hey Kid" led the NL in slugging percentage five times, homers and stolen bases four times, triples three times, and runs scored twice. He had 3,283 career hits, a .302 batting average, a .557 slugging percentage, 1,903 RBI, and 2,062 runs scored. 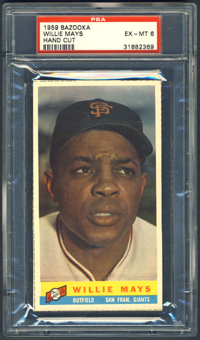 Comments: In December, 1998 I picked up a 1967 Topps PSA 8 as my first Mays portrait. I later sold the card in June, 2003 on my website for a profit. 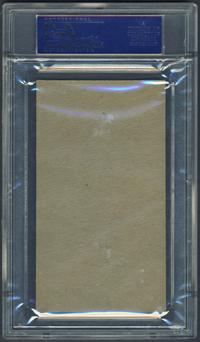 I took the winnings and purchased another example - also in PSA 8. In September, 2006 I decided to replace the 1967 Mays and started looking for a 1959 Bazooka issue. 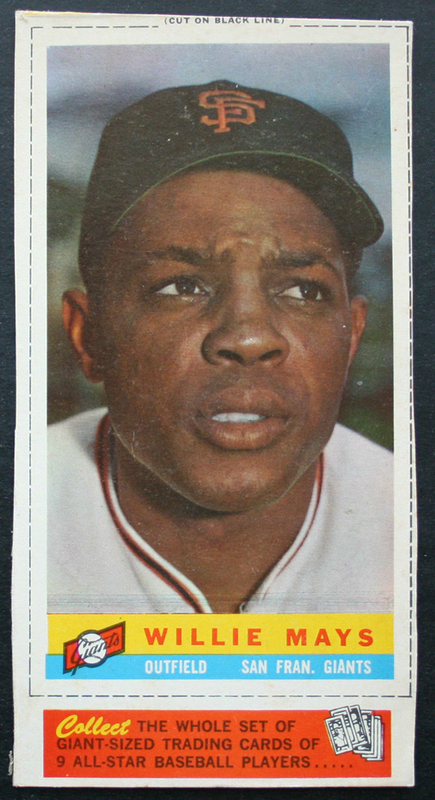 I owned a 1967 Topps Mantle and figured it was a good option to diversify the collection. I picked up one example in August, 2007 but PSA ended up slabbing it Authentic due to missing perforations. I sold it in November, 2007 when I purchased a nice PSA 3 example on eBay. I won a PSA 4 VG-EX upgrade in a Andy Madec auction in November, 2009. 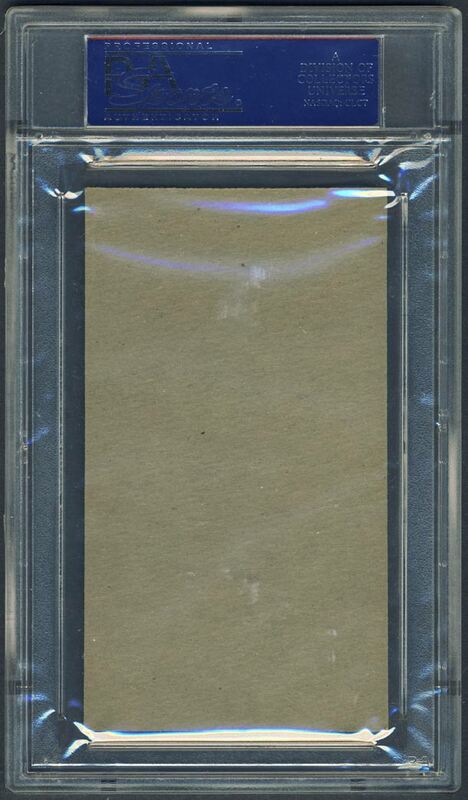 Then, picked up this PSA 6 in March, 2011 with a BIN on eBay offered by TNT Collectibles. It's tempting, tempting to consider what a paper cutter can do. Description: The 1959 Bazooka set, consisting of 23 full-color, unnumbered cards, was printed on boxes of one-cent Topps bubble gum. The blank-backed cards measure 2-13/16" X 4-15/16", when properly cut. Nine cards were first issued, with 14 being added to the set later.